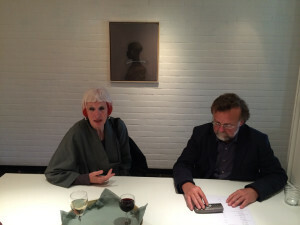 De Queeste Art Gallery owner Dirk Vonckx and Marcelle Hanselaar. Installation shot of the gallery owner Dirk Vonckx and the artist at the preview of my painting show The Wondrous World of an Introvert. This show is beautifully presented in a very sparse way, only 2 or 3 paintings per room, the result is that my work looked like even I had never seen it before. Very lively responses and some good sales already, do try to see it before the end of this month. 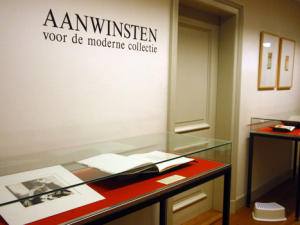 My book Notes from an incomplete journey, recently added to the Meermanno Museum collection is now on view on the 2nd floor under Acquisitions/Aanwinsten of their present exhibition; Vogels/Birds. Now I am getting work ready & framed for Multiplied Art Fair starting next Thursday. In the meantime heard that the V&A has decided to acquire two of my prints, Child Soldier 2 and White Collar Black Man to their collection, copies of these prints will also be at Multiplied Fair with Julian Page. Before the end of the year I have been invited to take part in a group show in Berlin and another one in Zurich. And that is it as far as I know for this year. Next year will start with my solo show at Clifford Chance HQ.